Location: Forum Index » Other Crafts » Stamping & Cardmaking » Cardmakers chat group. 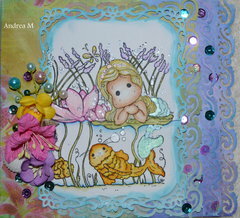 Hi I wanted to start a cardmakers chat group. We can share our cards, ideas, tips, purchases and love of making cards. Be respectful of others work. Leave some love. everyone can use some encouragement. Edited by andrea m on 02-01-18 10:53 AM. Reason for edit: No reason given. a birthday card i made for my niece. I'd like to join you. Glad to have you Amy. I love make cards. I just have to many I made. I just placed a huge order of stamps and 6x6 paper pads. Amy I ordered one of those art impressions stamps. Which one did you get?! I can't wait to see what you make. I love 6x6 pads too. I ordered the girlfriends laughing stamp. I loved the sayings that went a long with it. I plan to make a card for my bff. Fun one. I just got the Witch Wanda set, hoping to get motivated to make some Halloween cards. I ordered a whimsy stamp for my Halloween cards this year. I make them for kids and the little witch is adorable. I am hoping it arrives tomorrow so I can get started. I have to make four cards. When you finish your cards share them here. Cute cards ladies! I've made more cards this year than I ever have. Only drawback I have is that I get on roll with making cards and it never leaves me much time for scrapbooking. I like that I can go whip up a card or two in an hour vs. days working on a scrapbook page. lol Lisa I can relate to that. sometimes I think I should just switch to making cards. Then I get motivated and go back to scrapbooking. I love that doing both gives me a creative outlet and a break from each other. i would love to know how to make a card with my stamps I am not good at it. yea it easy for me to do cards then scrapbook. I wish I could do stamps good but I just feel I am not great. It takes me almost just as long to make a card as it does a layout. I'm just slow lol. Danielle, do you mean coloring them or what? What style of stamps do you mostly have? Lol Amy i spend a lot of time coloring. Do you use copics? I color with distress inks. Danielle I watched lots of you tube videos on coloring stamps. I also spent a lot of time practicing what worked for me. I have stamps from stamping up .yea coloring them. I use watercolor pencils. So far, they're all I've tried. Danielle I never really used stamps much until I started making cards. 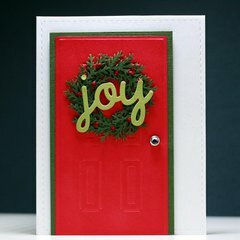 There are some great cardmakers out there who do instructional videos I really learned a lot from Kristina Werner and Jennifer Mcguire's videos. You can google them and to go their blogs or just go over to YouTube and look the up. You can learn a lot of cool techniques that and also how to put your stamps to better use. Yes! I love this! Can I join? I love to make cards! Of course Kayla we would love to have you. Two Christmas cards I made recently. I decided to get an early start this year because I'm a last minute kind of person and I'm trying to break that habit! I have a question: what is the standard size of a card? I don't know if it's standard, but 4.25" x 5.5" is very common. Donna the size Amy mentioned seems to be the standard. On most card tutorials or other website they might refer to it as an A2 card. Kayla Good for you getting your Christmas cards started. I always wait to long and never get as many made as I want. Maybe this year will be better. Yes, that is A2 size. I think it's very common because you can get exactly two cards out of an 8.5x11" sheet of cardstock. There's no waste that way. I like my cards a little bigger sometimes though at 4.5x6". I always have both size envelopes handy. Can I join? I LOVE card-making. I'll be no help with standard size questions though. I live in the UK and our sizes are different from in the US. Actually everywhere is different from the US! We have A4 which is slightly taller and thinner than your 8.5"x11". So our "standard" card sizes are A5 (A4 folded in half) or A6 (A5 folded in half). Our envelopes are C5 and C6 respectively, just a little bigger than the card sizes. Hi Rosey glad to have you here. I finish all my Christmas cards I just need to get a pic of us and dogs. I am think we will go up to the mountains to take a pic before it get to cold out here. last year I Waite to do Christmas cards because I was so busy with work and other stuff. but this year I have time. 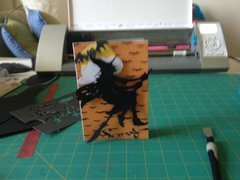 I usually take a piece of 8.5X11 cardstock and cut it in half and than I have two cards to make. Wow! Danielle, you're way ahead of the game! I usually end up spending Thanksgiving weekend rushing around making cards. I make around 50 every year. It usually takes me a couple weeks to finish off my list. I was actually thinking of starting them soon so I'm not so rushed this year. I Started getting into stamp coloring about 3 years ago. I love the Magnolia stamps and now have about 100 of them. I am wanting to try some other stamps. What ones are some of your favorites? Magnolia stamps are very cute. I haven't been able to pick up the love of stamp coloring but I enjoy seeing everyone else's. There are some great video tutorials out there. For some reason I just can't get into it. Lisa coloring is not for everyone that is for sure. I like to make cards with lots of other techniques to. I have been buying a lot of spellbinders dies this year. It must not be but it sure is pretty. I'm in awe over some of the shading affects that cardmakers put into some very intricate stamp designs. I do enjoy watercoloring a lot though. So fun and it seems like no matter what I do I can't fail with watercolors. I don't mind coloring, but I really dislike coloring skin because I have a hard time with it. So what do I keep buying? People stamps. most of all my stamps and when I use to go to stamping up parties. so I have lots of them and other stamps I got from other places. I a just not good at stamps I would love to. I have watched a ton of you tube videos on coloring skin and I still have trouble with it. My stamps came today. I can start my Halloween cards this week. I finally bought a stamp a majig tool. I dont know why i waited so long that thing is awesome for stamping. Do you have favorite cardmaking tools? i would say my bone folder , my die cuts machine. Edited by southern lady on 09-10-14 11:31 AM. Reason for edit: No reason given. Definitely my Cuttlebug and dies. Hmmm...probably my scoreboard for doing different folds. Since my selection isn't that big I would have to say my embosser and stamps. Oh, I saw the words "copics" and "cards" and here I am!!! LOL. I am a huge copic fanatic, so I'd say they are my favorite tool for making cards. Also love my trimmer, 6x6 paper pads, cutterbee scissors, and nestabilities. I haven't been on this site a lot in the last year or two, but I am trying to come back and get back into things. I need to update my gallery! For those of you looking to learn how to color with copics or distress inks for people stamps, Kit and Clowder has amazing online classes. I just started the skin and hair class and love it. Oh, I forgot to answer one of the questions about fave "people" stamps, in addition to Magnolia: Ching Chou Kiuk (find them at SweetPea stamps), Elisabeth Bell, Sylvia Zet, and Saturated Canary. Oh, and CC Designs and The Greeting Farm. Oh, yeah, Lili of the Valley. I could go on and on for ages!!! LOL. Facebook has several groups of people selling their scrapbooking and card making inventory. I've gotten some great deals on stamps that way. Hi Gina welcome to our group. I just ordered two lilly of the valley stamps. I cant wait to get them. Another tool I bought this year is the envelope punch board. i love that thing. I made My mom several cards and envelopes for her birthday. She loves to send her friends cards. Lisa I love my cuttlebug. I use it way more than my cricut especially now that I have started making more cards. Amy i have a Martha Stewart score board. Which one do you have? I ordered an embossing folder today but it's 8x8. I'm hoping my dad can cut it down so it'll fit in the big shot. He says no problem. While I was at it, I ordered some stamps and a die. The envelope punch board is nice. I saw a video that showed how to make cute bows with it (kind of like the Tim Holtz die). They'd be cute on little presents. 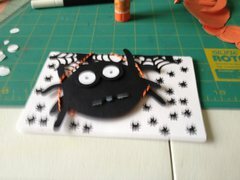 i am use my cameo a lot with make cards. I can't really order much seen we don't have much money seen I am not work yet. but I buy once in awhile. I'm on a budget too and don't shop often. I try to buy more versatile things now. I agree the envelope punch board is really cool. I'll have to look for that bow video. I found a video to make envelope boxes with that punch board. They hold about 6 cards and envelopes. I've been wanting to make up some card sets to have on hand for gifting. I've already given a few sets out and get a great reaction from my friends. I have a certain amount I can spend each month. I used to buy all kinds of things. Now i really think about my purchases and how i can use the items. I will often save my money for several months and then make a huge purchase. Amy glad your dad said he can cut your folder down. I have a bunch of embossing folders and really need to use them more. Lisa if you make the box share it so we can see. well I am try to do thanksgiving card. 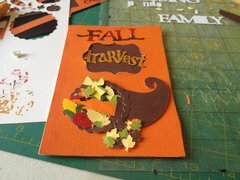 I would love to do fall cards. Are we talking budgets? Omg, I am on a tight,tigher, tighest budget. I am really giving my stash a run for it's money and also getting creative. For a long time I just spent on anything I wanted like a child. Donna I have been in that position many times. I am thankful now that I have some freedom to buy things. Its also nice to use your stash and feel good about not wasting money on things you never used. am want that envelope punch board. dose any one have this and if so do you like it ? I have it and like it. It's easy to use. Amy your cards are just wonderful. Thank you. The witches are a stamp, I think it's from great impressions. I got home from work and my package of paper pads and stamps was waiting. I hope to start playing tomorrow. Yeah, It's very uncomfortable , but I will get through it. And I will be wiser for it. 100% happy with the envelope punch board Andrea. It's such a cool tool. I've been searching around to see how many other things can be made with it. So many creative ideas out there. I love that you can make a card box with it and I just made up some pretty bows. Check out YouTube for ideas. I use the card boxes to give away sets of my cards to my friends. They love them! Lisa I will have to look on you tube. I made my first set of cards as a gift this year. I want to make more though. Playing around with some Christmas card designs today. I just can't get in the spirit this early. Lisa you are still ahead of me. I did not get much crafting in this weekend. I got a lot done around the house though. I can't think of Christmas yet! No crafting this weekend for me either. Lisa -hope you can get in the spirit to do Christmas cards. yea it was hard for me to get my Christmas cards but I want to be ahead. that way I can send them on time. I just have to take a pic of us and be done. now I need to start work on make tags Christmas ones. Well I made my first Christmas card for 2014. Only 49 more to go. LOL! Lisa that is wonderful. I love it. Edited by andrea m on 09-15-14 11:44 AM. Reason for edit: No reason given. Yay! Hope you like it. I got the stuff I ordered last week today too. I got two of the stamps I ordered today. I am still waiting on another one and some paper. 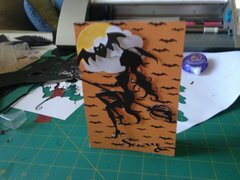 I finished the project i was working on so now I can start my halloween cards. I was requesting to join your conversation, as I am always interested in ways and techniques to make beautiful cards. hi ygandia. you are welcome to join in. I'm not here a lot but I'll say "the more the merrier!" Amy what water color paper do you use? I got one image all colored for my first halloween card. I need to put my card together today. Maybe this is bad but I just use cardstock. It's ok as long as I don't use too much water. my it must be just fine since your images look great. Lisa your Christmas card is beautiful! I have that punch - I'll be stealing your design I think. LOL! You can thank Pinterest for that design. I loved the cute little wreath too. I get a lot of inspiration from pinterest. Kayla I use water color paper because i color with distress inks, and markers. I use hot pressed water color paper. You can buy it in an art store. I also use distress inks but I only use regular paper. Would Hobby Lobby have water color paper?